14 people think this report is great. Weather forecast had been constantly changing all week but on Friday suggested an east/west split with good conditions all weekend in the west. Had dinner on Friday and drove up to Torridon – locked up a bike in some trees at the west end of the Liathach path ready for the following day. Only managed a few hours of broken sleep – fog and rain at 0400hrs so closed my eyes for a wee bit. Eventually got up, had breakfast and set off at 0540hrs telling myself that the forecast would be right and conditions would improve. Fog and clag meant that I could hardly see anything – in the light, fine rain got rather damp quite quickly but it was really too warm for wet weather gear. 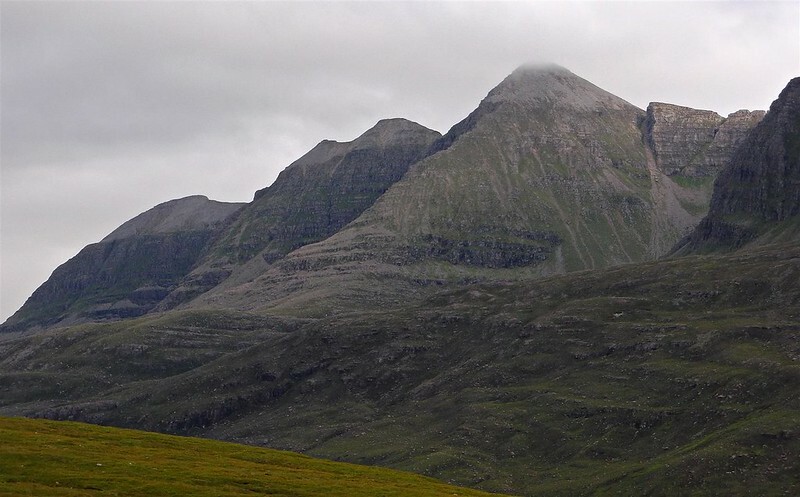 I had previously considered combing Liathach and Beinn Alligin (anti-clockwise) by walking down via Sgorr a’Chadail. However, the walking distances were about the same but it would mean a longer bike ride. Decided to keep them separate. Walked up the eastern track past some waterfalls. Couldn’t see anything in the clag and no sign of it lifting. 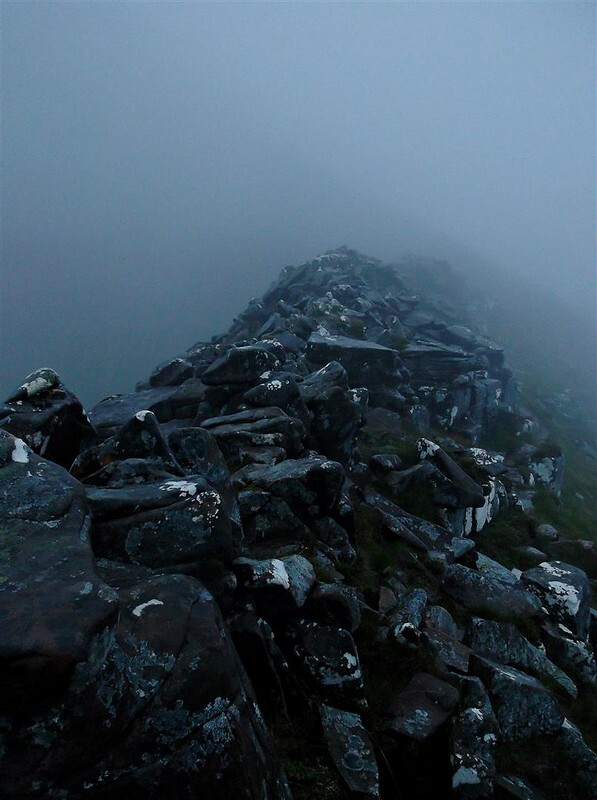 On reaching the ridge, decided against the walk over to Stuc a’Choire Dhuibh Bhig – in the fog there would be nothing to see. Walked up to the 983m point. Headed west and up to Spidean a’Choire Leith. No view at all. Didn’t hang around for long, clag and rain still persisting. It looked as though I’d arrived a little too early for the east/west split in the weather and it had still to move off to the east. Initially headed off in the wrong direction and had to contour back round to find the path. On towards the pinnacles. 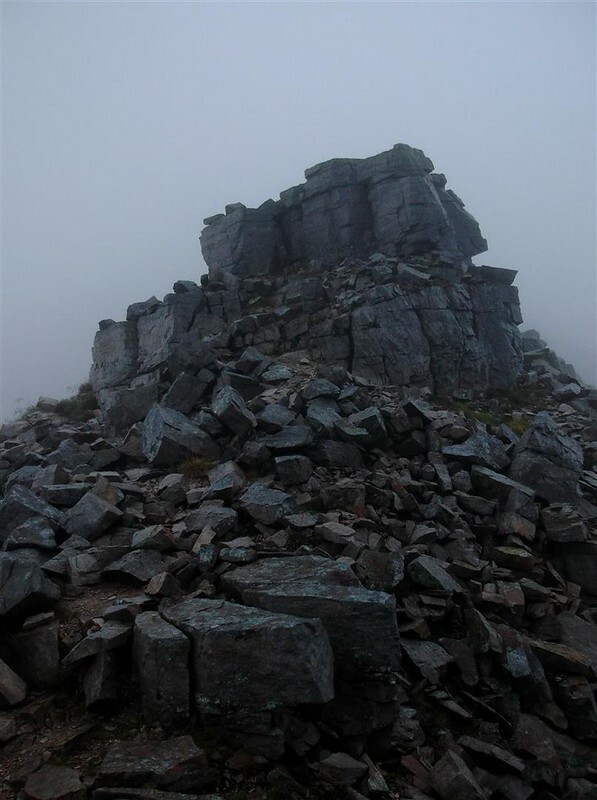 It was difficult to make out anything in the fog – couldn’t see a bypass, followed the path and think I went over the first pinnacle which didn’t seem too bad. However, after that I could only vaguely make out shapes in the clag. Being on my own and not being able to see where I was going, I decided that clambering over pinnacles was not a good idea. The path split at this point so reluctantly opted for the bypass. Although I had read that it was exposed with sheer drops, it seemed OK to me. There were parts where care was needed but it may be that the clag helped out – couldn’t see beyond a few metres below me. 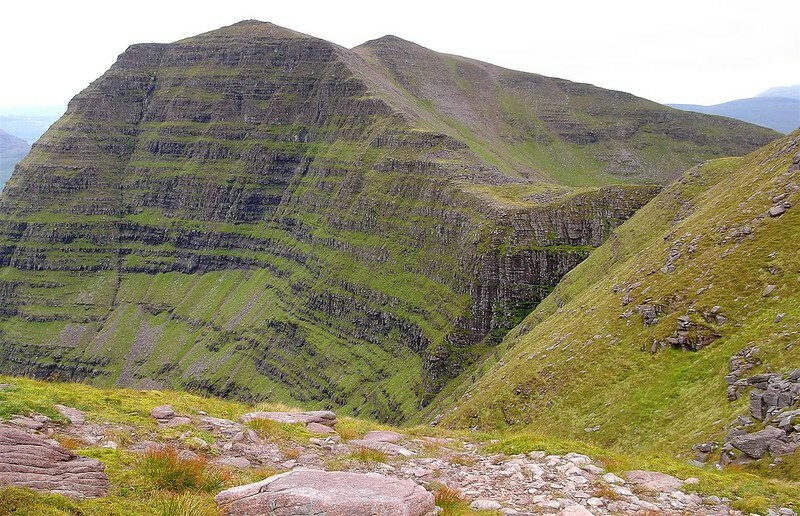 Followed the path round and then back up to a broader ridge which took me up to the summit of Mullach an Rathain. There was a sign explaining about path works and warning against taking the usual return route. Being very early on a Saturday morning in adverse weather and thick clag, it didn’t seem likely that there would be any helicopters out or work being done. Decided just to take the usual path back down. 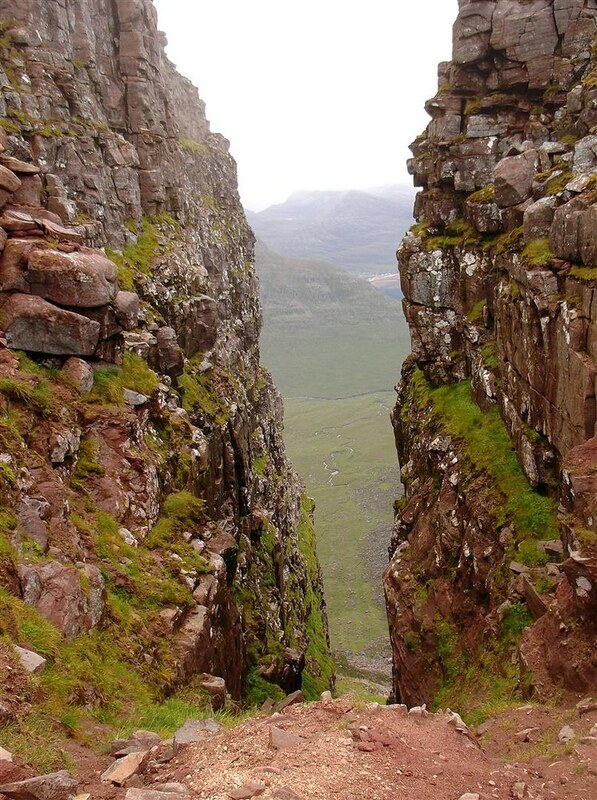 Scree at first then it became easier going. Needless to say, the weather started improving as I got to the bottom. Liathach’s another hill to add to my “revisit in good weather” list. Had a chat near the roadside with a couple who were starting to head up – looked a lot better for them. Recovered the bike and cycled back to the car to have an early lunch. Drove through Torridon and managed to squeeze into the Beinn Alligin car park. Weather was now significantly better. Looked like the hills would be busy. Had wondered about going anti-clockwise but in the end set off NW to go clockwise and leave the horns to the end when hopefully the weather would be at its best. 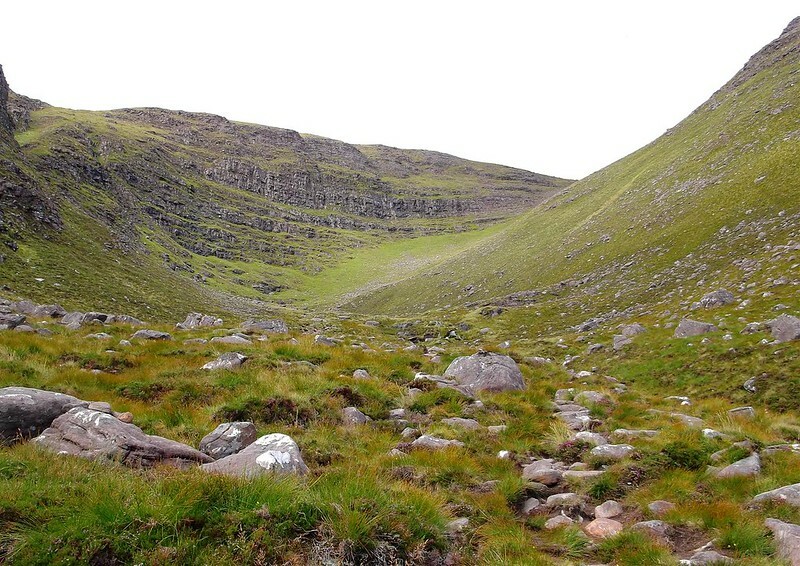 Followed the path up which enters Coire nan Laogh. Reasonable views now that the clag had lifted but still cloudy. 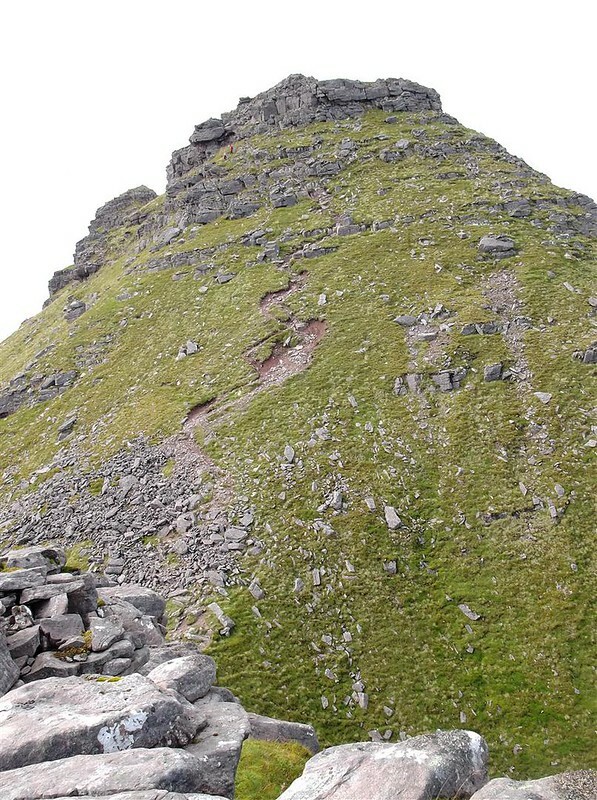 Just a case of following the path up to the col then turn right and it’s a short walk to the summit of Tom na Gruigaich. Met a group of walkers here who headed off just as I arrived. Stop for photos and some refreshments then off northwards down the slope before the north east climb to Sgurr Mhor. Weather had definitely improved but the views weren’t really very clear. 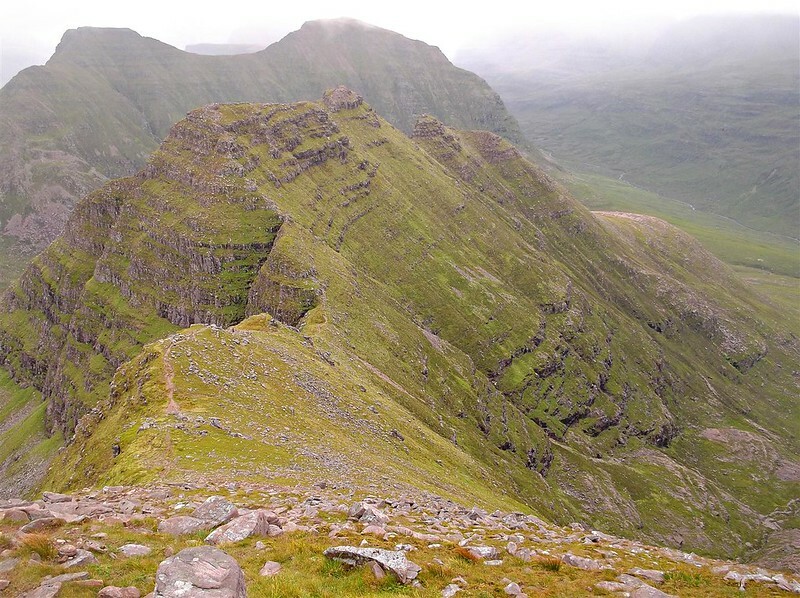 Got up to Sgurr Mhor – lot more walkers out on the hills now. Clag was down at the top so couldn’t see much again. A little cloud here and there hid the views to the horns but got a much clearer view lower down. 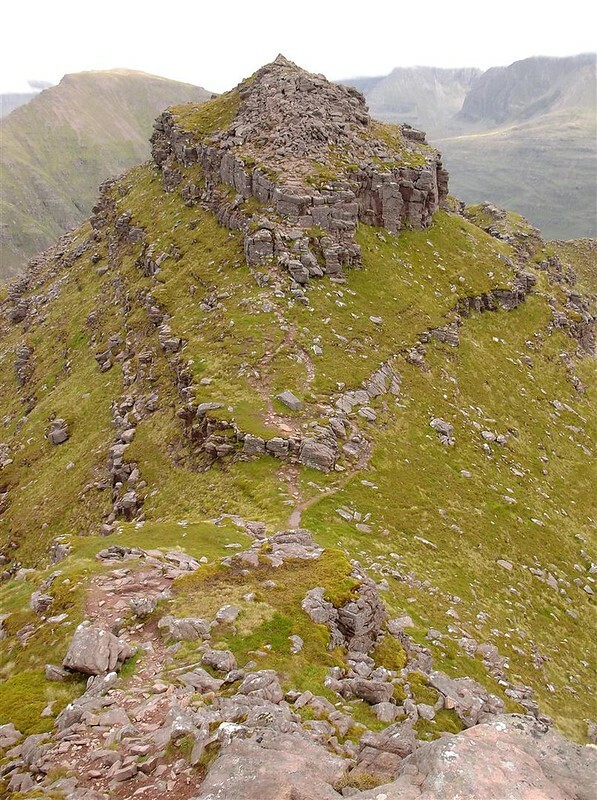 Given that I’d missed much of Liathach’s pinnacles due to the weather, was very glad that it had cleared up so much. I wasn’t sure what to expect and had been a little worried about how much scrambling would be needed and the degree of exposure. In the end they all proved quite straightforward. Some scrambling needed on the ascents and descents but nothing all that tricky. 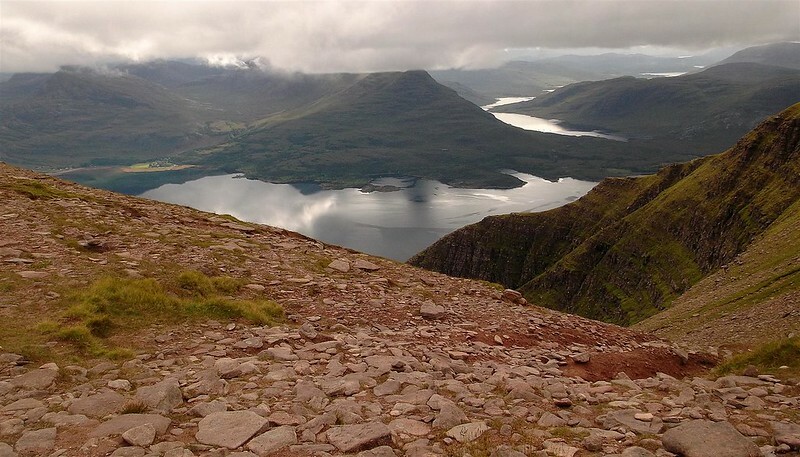 Stopped for quite a while on the top of the last horn – just sat and gazed at the views over Loch Torridon and north towards Gairloch. Set off on the return route southwards and over the bridges – good path further down. 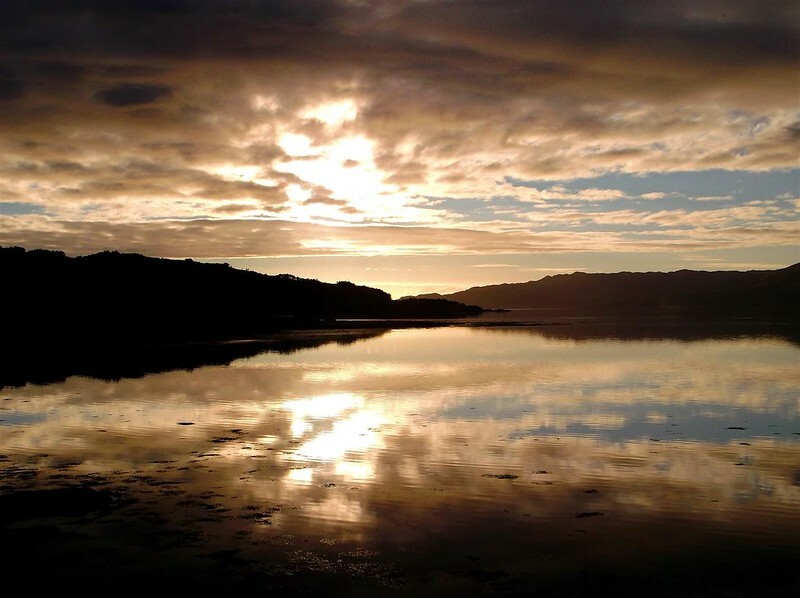 Nice evening in Torridon so took a few photos before retiring fairly early. Left the car very early at the car park at the end of Coire Dubh Mor and cycled up the start of the eastern approach to Beinn Eighe. Locked the bike to a pole and headed up the track past a group of trees. Early sun starting to rise. 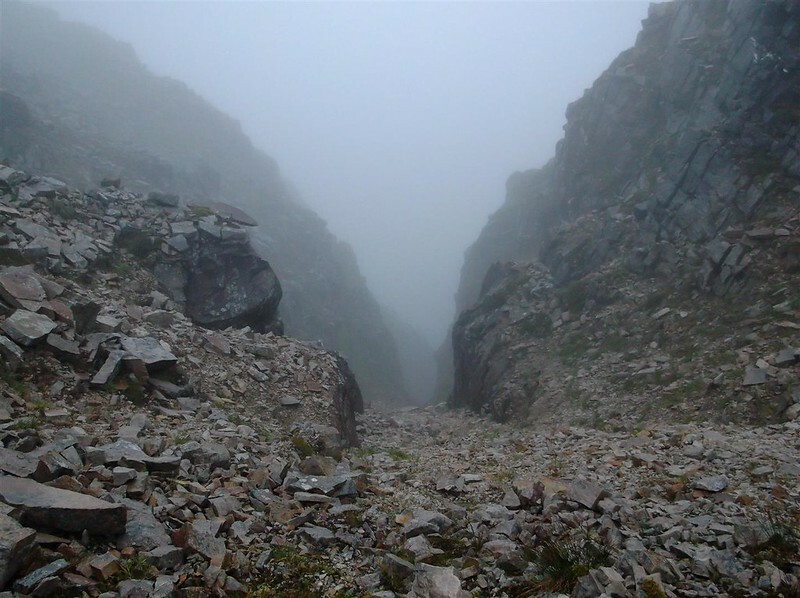 Great path up which led into Coire an Laoigh where it became fainter. Still a bit of clag blowing in and out occasionally but no complaints – views a lot clearer than the day before. 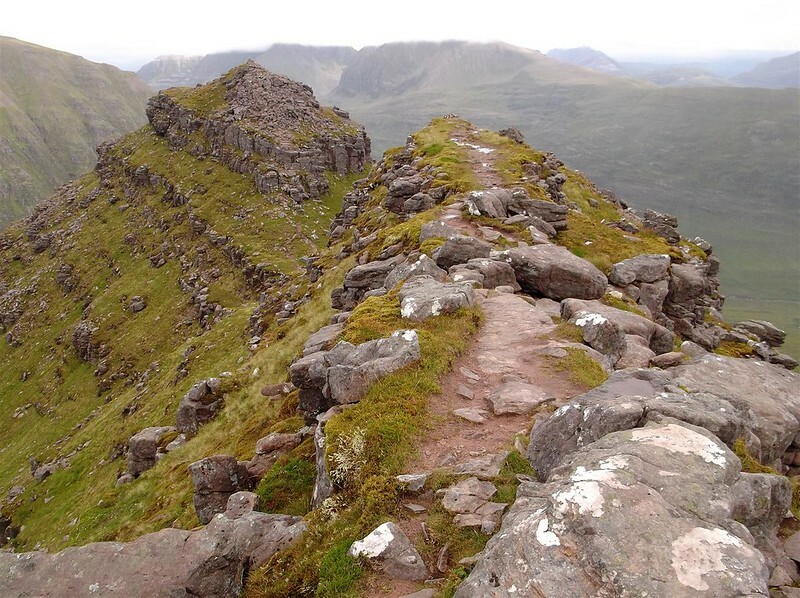 Rather than head up to the trig point then turn right, I took a more direct line up through the rocks to a point just NE of the summit – then a straightforward walk up to the top of Spidean Coire nan Clach. Over the rocks and down to the ridge before the walk NW in the direction of Coinneach Mhor. Everything looked far away but it didn’t really take that long. Sauntered along, hands in pockets, quite happy that the weather had delivered. 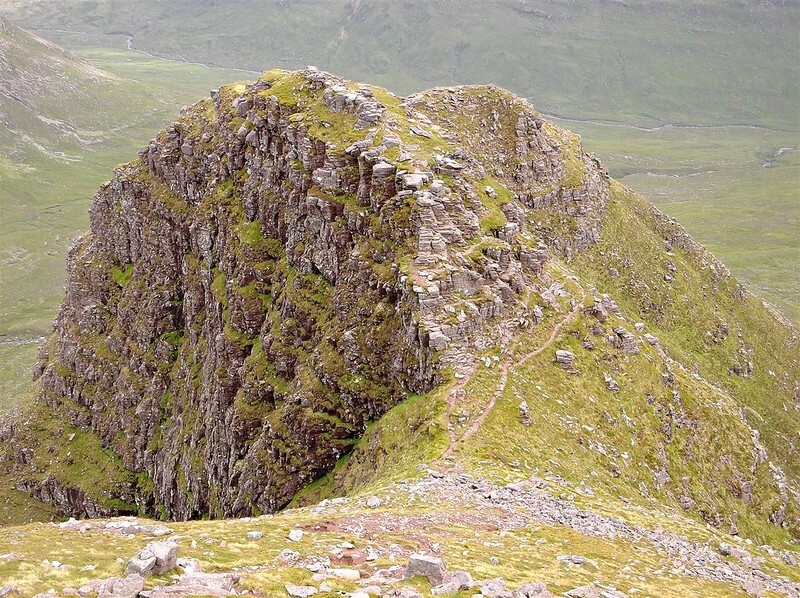 Spotted a wee track which proved to be a short cut over to the north ridge to Ruadh-stac Mor. Had a look at the scree path down to Loch Coire Mhic Fhearchair – nice views to the loch and Sail Mhor but I was planning to return by a more direct route. 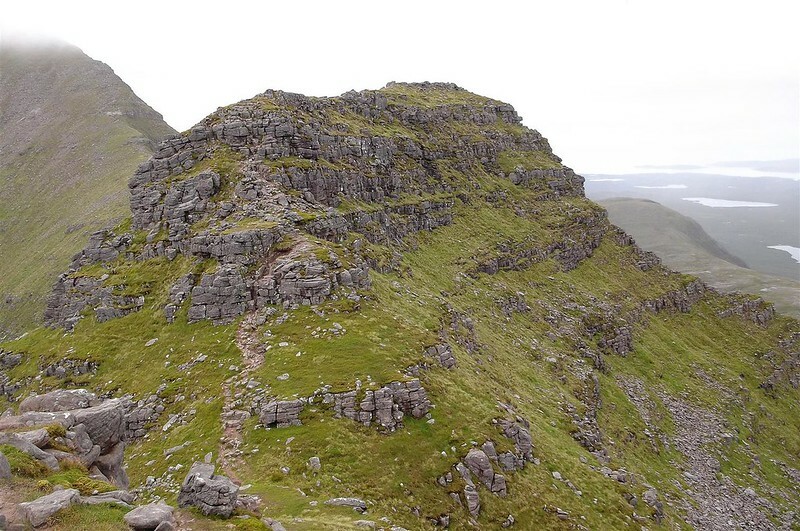 Then just a case of walking up to the summit Ruadh-stac Mor. Stopped for photos and refreshments –could’ve stayed here all day enjoying the views. Retraced my steps southwards. Jagged rocks. Took the short cut track back to the top of the scree slopes. There appeared to be quite a few loose tracks in the scree so I headed down one of them. Quite a lot of surfing and sliding in the scree being careful not to fall over. Had to zigzag a bit to get the best line. Further down I could see a faint track from the bottom of the slope south to the Allt then up to the main Coire Dubh Mor path. 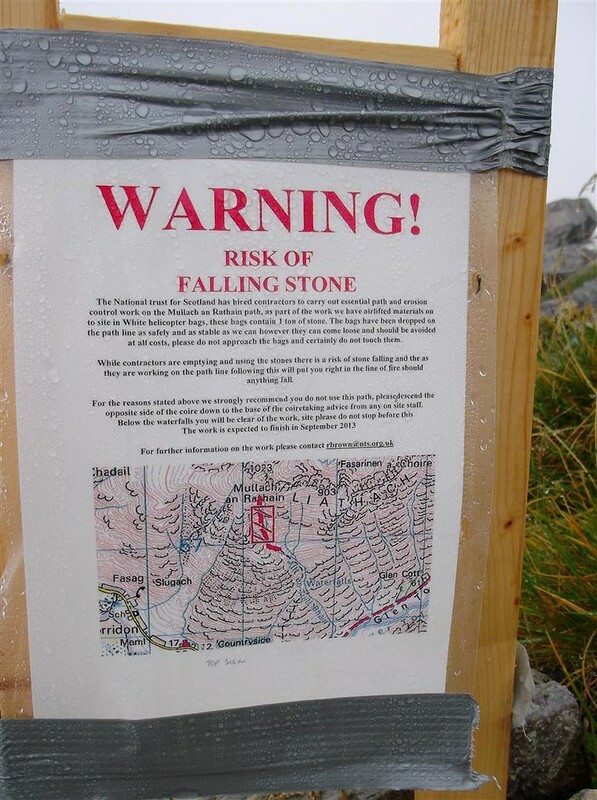 Got to the bottom, on to the path, found some stones for the two crossings of the Allt where it split then on to the main path for the walk back to the car. Met quite a lot of walkers on the way up the path. Back at the car at just after 1130hrs, headed off and picked up the bike before driving to Garve then up to the Ben Wyvis car park. Needless to say on such a nice day, the car park was very full. Waited a bit and got a space when one car left. Got ready and headed off up the track. Not a lot to say which hasn’t been said already about Ben Wyvis. Followed the excellent path up through the trees then into open ground where it zig zagged up to the 946m point. Rocky steps in a lot of places made for quick going. Met a lot of walkers. Up to the 946m cairn before turning NE for the long walk to the summit. 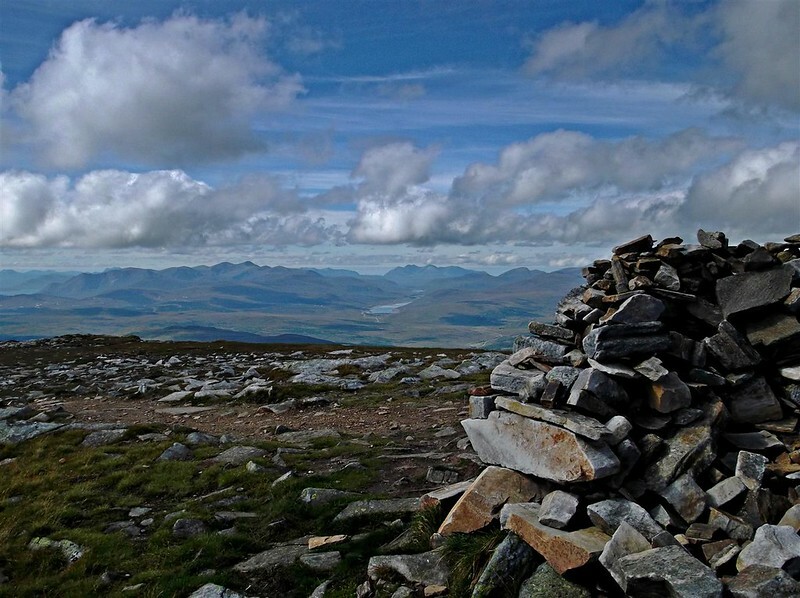 Nice views from the summit – met some other walkers here. Stopped for a wee bit before turning to retrace my steps. Excellent weather, topped up the sun tan as I walked. Didn’t take long to get back down to the car where I got everything organised before heading off. Brief stop in Inverness for fuel and food then a nice drive back to Glasgow in the evening sunshine. Superb RH,you crammed a lot into 2 days there Shame about Liathach,we had the same weather as that on our first trip to Torridon and done Beinn Alligin and half of Beinn Eighe in crap weather so good reasons to return Where'd you stay on Saturday,?Could've met me and Gav for a pint You've not many to go now,any plans for compleation? 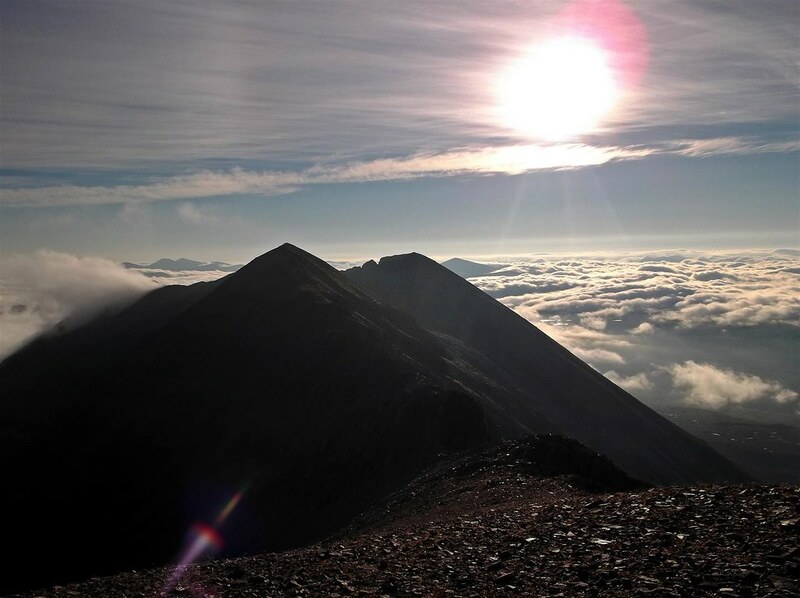 Wonderful set of photos, all so different with varying weather conditions. Love the shot with the two stags. Your hardy cramming all that in over the two days I had a varied two days myself in the Fannaich , not bad on Friday poor and wet like your round on the Saturday. Your closing in on that bag now R , any thoughts on the last one ? pigeon wrote: You've not many to go now,any plans for compleation? Collaciotach wrote: any thoughts on the last one ? Great report and fantastic photos. I wonder if I could manage that many hills in two days. Maybe, but would probably half kill me. Another beauty of a report, rockhopper. You got enough good weather in there to make it a really good trip. 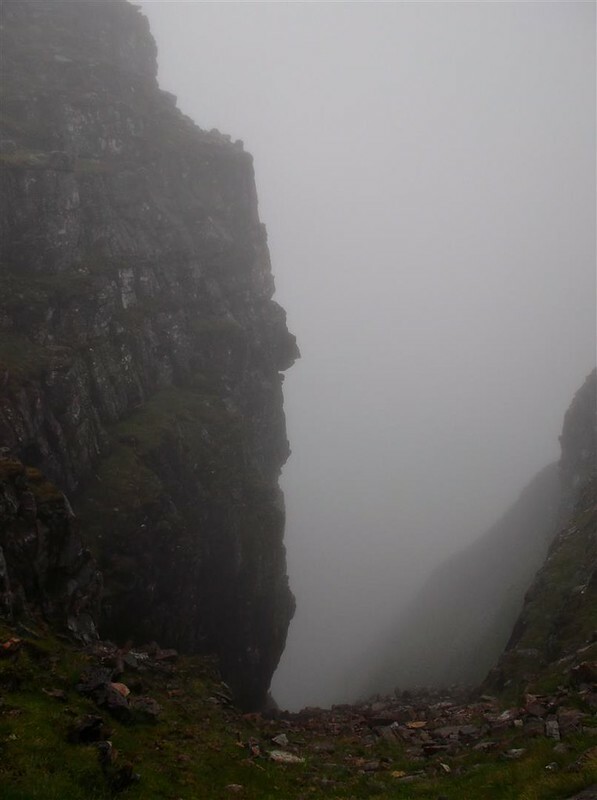 I know the feeling you got when you had to make the decision on Liathach; the same thing happened to me when I chose to bypass the An Teallach pinnacles in poor visibility. The Horns of Alligin must have more than compensated, though. 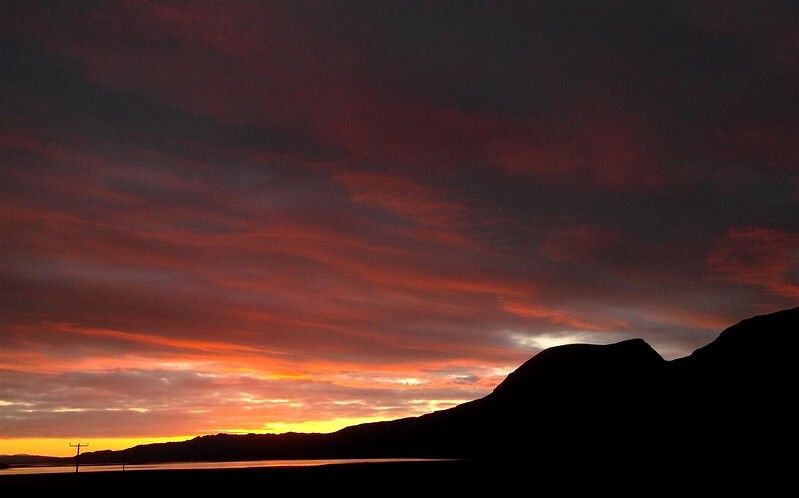 Stunning Torridon scenery, and a nice finale on Wyvis. Superb once again RH you never do anything by half. Do you think you will complete this year and have you chosen which hill or hills. A couple of nice big says once again Rockhopper. 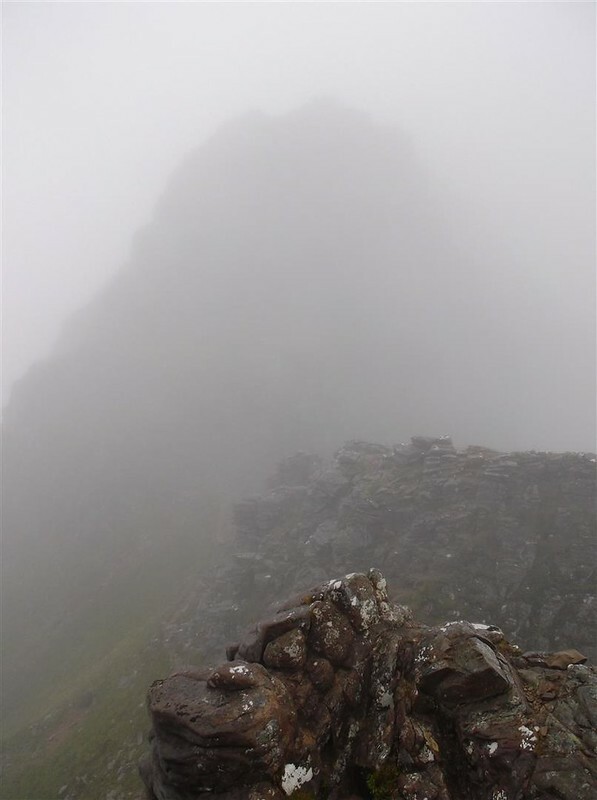 Real shame about visibility on Liathach though. 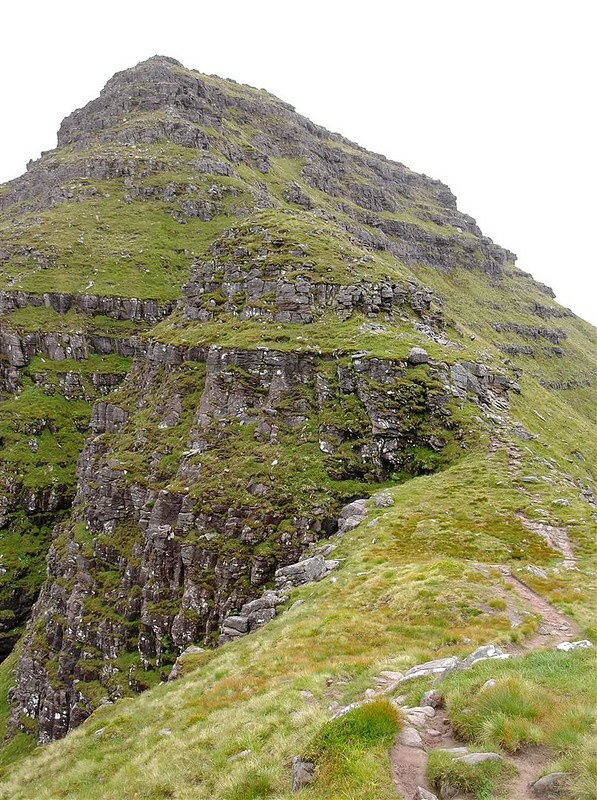 You must be kicking your self about missing out on Triple Buttress and even Stob Ban farther along the ridge. Cracking report there Rockhopper shame you never got the views on Liathach but the rest of you weekend more than made up for it. 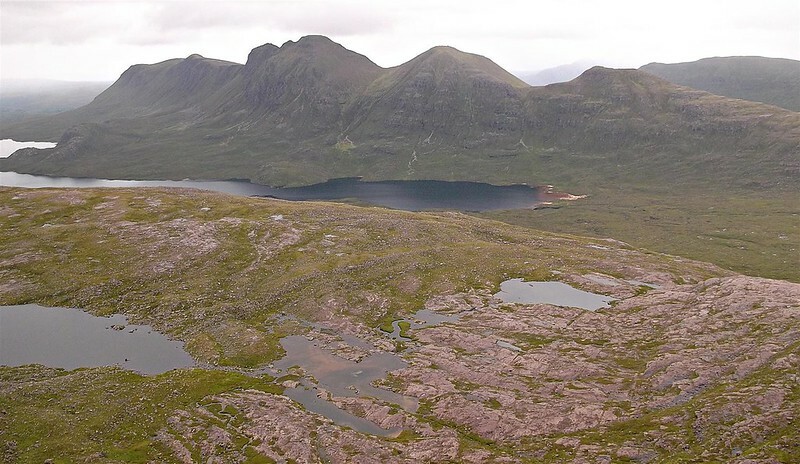 Stunning photos there, Torridon is such an amazing place. 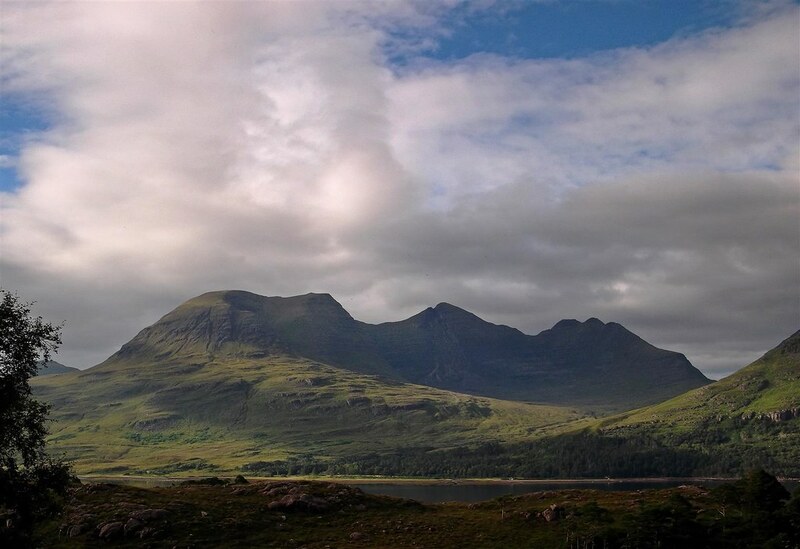 Pity about Liathach but your other photos are stupendous. 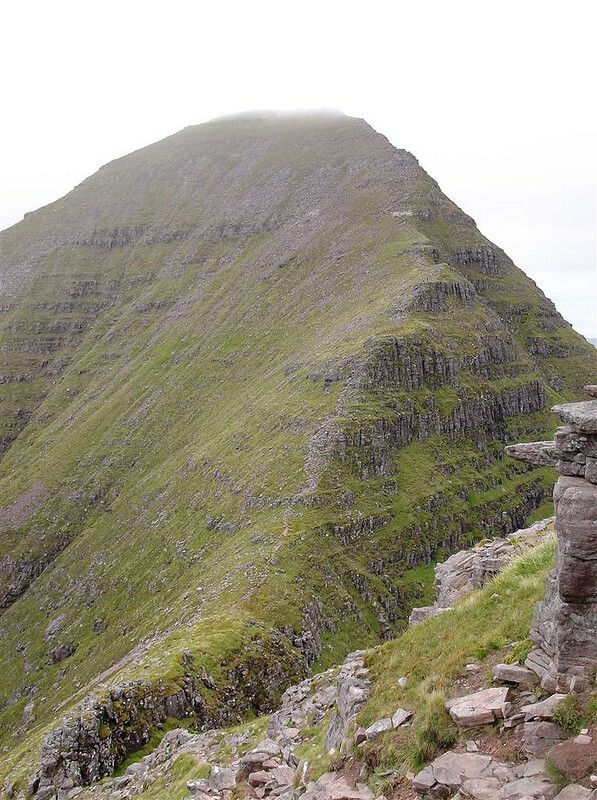 I've yet to do Liathach - maybe join me on my compleation, whenever that is? 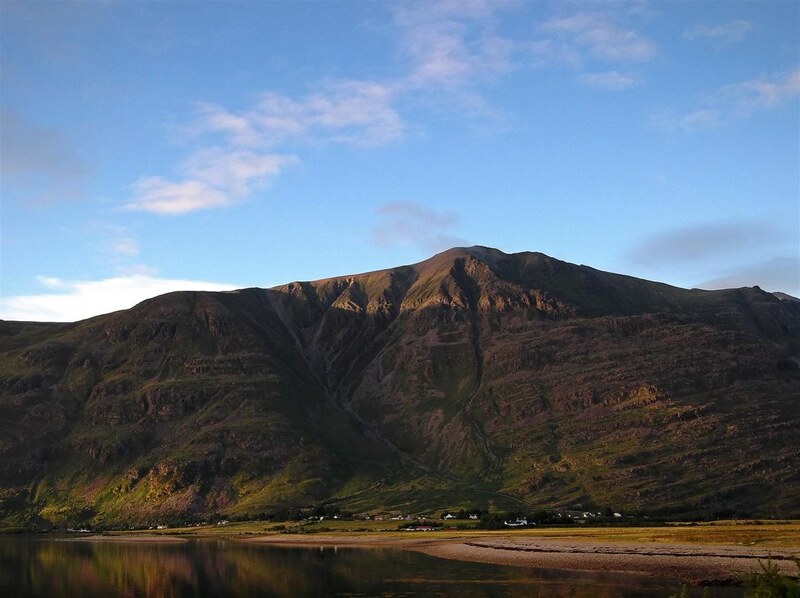 PS could it be that this Torridon mountain-fest was part of a rather special birthday treat?? ?